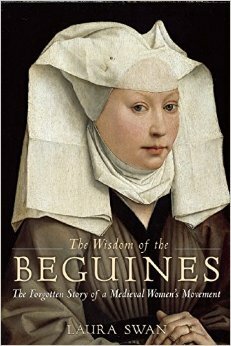 The Beguines are a fascinating group of women, and the more one learns about them, the more intriguing they become. Benedictine Sister Laura Swan has written a book that is clear and not technical, accessible and balanced to those unfamiliar with these unique figures, while full of information for those who may already know something about them. She presents the story of a group of women who not only defied the categories of the church and the state of the time, but who continue to blur them now in the telling of it. These women were dangerous to the institution of the church in various ways; they taught that ordinary people could experience a deep connection to God without the need of an intermediary such as the clergy or hierarchy, and many were themselves mystics, those who experience God’s love directly. “These women spoke from the depth of their experience of God, rather than from mere rational, philosophical argument. Knowledge of God was first and foremost gained in experiencing God’s love and in loving God in return.” They battled charges of heresy at times, and Sister Swan admits that a few may have indeed been heretics. Sister Swan shows us how they lived, what they did in ministry, in their writing and preaching, and shows us specific figures, although in some cases we don’t have a lot of biographical information about them. She provides a clear, reliable source for a long-neglected topic, and her survey is grounded in solid scholarship. Although some may find that her circle of inclusion is a bit too wide when she includes figures such as St. Catherine of Siena as a Beguine, she reminds us that a group of medieval women, across various centuries and ethnic groups, embodied Gospel freedom in a way that still intrigues us. Sister Laura Swan offers us the opportunity to peek into a chapter of church history worth knowing more about — for both men and women. Finley is the author of several books on practical spirituality, including “The Liturgy of Motherhood: Moments of Grace,” and has taught in the religious studies department at Gonzaga University for many years.